The photographer, Cindy Sherman, had an image as a feminist artist. In a trademark practice, she would pose for all of her photographs, dressing up with different costumes, wigs, and makeup in order to portray a wide range of personas and characters. Several of her pieces can be related to scenes in Hitchcock films. As an artist, Sherman liked the concept of the “Doppelgaenger”, or body double; she also employed the reflection of perceived self through the use of mirrors, a theme which appears in several Hitchcock films. Sherman was also captivated by blondes, another one of Hitchcock’s preferences for leading ladies. The image below, from Sherman’s Untitled Film Stills collection, reminds me of Norman Bates dressed up as his dead mother in Psycho; both her expression and the lighting are reminiscent of the dark, tense climate of the film. Roads are a frequent plot device with Hitchcock films, and Sherman was intrigued by them as well. 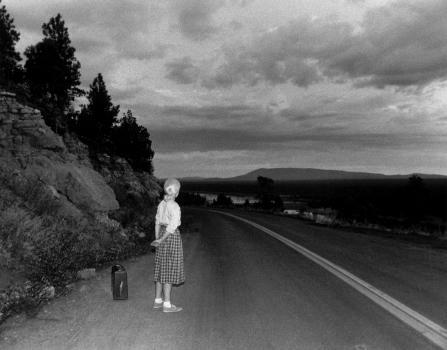 In one of her images she photographs a lone and isolated woman standing on the side of the road waiting for someone to drive by so that she can, presumably, hitchhike a ride. Vertigo, Psycho, and Suspicion all use very distinct driving scenes. This entry was posted in Hitchcock and Contemporary Art on April 21, 2014 by Tasherit Sturm Dahal. Hitchcock’s legend (and his profile silhouette) live on today via his films, story books, and television series. In fact, his unique personality has been lovingly recreated and used in some unexpected ways. Whether it is a remake of one of his classics, or an imitation of one of his films as a cartoon, Hitchcock is still in the public eye as an easily recognizable cult figure. Hitchcock’s famous persona was also used in the 1960’s hit animated series, “The Flintstones”. The character in one of the episode utters the famous “Good Evening” greeting in the same long, drawn out manner of speech he used, and is patterned directly on his seemingly ominous and suspenseful character. In real life he was somewhat of a practical joker and would undoubtedly have wholeheartedly appreciated his having been made “immortal” by such a popular television series. This entry was posted in Hitchcock Homage on April 6, 2014 by Tasherit Sturm Dahal. I would have to argue that Vertigo wasn’t the best of Hitchcock’s films in my opinion, and I am frankly quite surprised that it received the ranking of No.1 on the list of “50 Greatest Films of All TIme” according to The British Film Institute. The storyline moved along with a great deal of deliberation, but also with some tediousness. Dr. Johann Schmidt of the University of Hamburg believes that this grindingly slow pace actually gives the viewer time to contemplate the situation and increases the suspense. I don’t know if I could necessarily agree with that. It may also be that audiences today have already been conditioned to expect a faster tempo with both plot and development. However, from a visual standpoint, there are some beautifully shot scenes in the film, especially the one in front of the Golden Gate Bridge. In one of the earlier reviews, Penelope Houston said that, “One is agreeably used to Hitchcock repeating his effects, but this time he is repeating himself in slow motion.” I do agree with that. All the usual Hitchcock motifs and themes are there; they’re just dragged out in the film. If I were asked to select another Hitchcock film for the top spot, I very well might choose Rear Window. The storyline pace is comfortable and fluid. The are no tedious moments, and the film has so many facets – humor, style, suspense, human emotion, and pathos. In addition, it manages to keep the viewer’s interest despite the fact that it basically takes place in one set location with a kaleidoscope of characters and activities while the main plot is steadily moving along. In my opinion, Rear Window would have made a better selection for the top honors. This entry was posted in Views on Vertigo on March 27, 2014 by Tasherit Sturm Dahal. In several of Hitchcock’s films, you will see a series of recurring motifs. For example, couples and beds, confined spaces such as trunks and bathtubs, and of course, blondes. Rear Window is an excellent example for all of these. These motifs contribute to and enhance the plot of the film. In Rear Window, the couples and beds motif is already built-in to the plot, since Jefferies has a broken leg, and has nowhere to go. Bathtubs also play an important role in the film, because that’s where Stella thinks the murder has gone down – and you do see Thorwald scrubbing the bathtub down later in the movie. Lisa, Jefferies’ girlfriend in the film, continues to prove Hitchcock’s obsession with blondes. Lisa, though, plays a very sophisticated type of girl, not one who is easily outmaneuvered when she wants something. Rear Window is my favorite Hitchcock film, and every time I watch it, I always seem to find something new, whether it be a small detail in the scenery or a comment that went unnoticed before. This entry was posted in Hitchcock Motifs on March 20, 2014 by Tasherit Sturm Dahal.